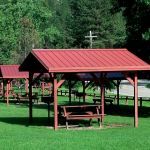 Ask fellow campers about "Kemp's Kamp" and nearby attractions. Nice campground conveniently located very near the town of Keystone and Mt. Rushmore. 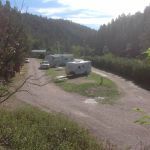 As others have noted, the campground is strung along the bottom of a narrow valley between the hills and a two-lane road and railroad tracks. The RV site we were in was short, the truck could not be parked immediately in front of or behind the trailer. The restrooms were clean, although 'rustic' and had a musty smell. The staff was friendly and helpful in helping us get into our site. We camped at Kemp's Kamp in a Travel Trailer. Big rig friendly with level sites. Wifi worked good most of the time. Showers were good. No dog park but lots of grass to walk dog. Pretty views of Black Hills National Park. Convenient to Keystone, Mount Rushmore, Crazy Horse Memorial, and Hill City. We camped at Kemp's Kamp in a Travel Trailer. Recommend you stock up groceries before you get here. The train was a good way to see the mountains. We loved this park. It's what a country RV park should be, level site, a stream right behind us, really great shade trees, well groomed area, table at each site. Although we faced a road, it was not a high traffic area and really quiet. Enjoyed the train coming by across the road on it's trip from Keystone to Hill City and back. The WiFi and electric were excellent, much better then the Military Base we stayed at close by. The owner was really friendly and helpful on choosing a good route back to SLC, UT. We'll be back next year and spend more time here. It is a great place to stay while visiting the area. The spaces are wide enough to enjoy kicking back and totally relaxing. We camped at Kemp's Kamp in a Motorhome. Keystone was less then a mile down the road and MT. Rushmore was another 2 miles from there. Great place to call home for the Black Hills area. Campground is spread along a road, but not noisy. The train ride comes by the camp about 4 times a day. The staff were friendly and helpful, even gave me a jump when my toad battery was dead. Restrooms were a little rustic for my wife, but were clean. Lots of trees and shade in the back in area of the camp. We will stay here again in the future. Don't recall the nightly rate, they do give Good Sam discount. We camped at Kemp's Kamp in a Motorhome. We found this park to be very pleasant. Although some sites are close to the road, the road is not busy. Many sites are only one lane so you have no one on the opposite side. This side faces the small creek and treed hills. The tents sites are great (we did not use) they have a covered pavilion on each site. The wildlife (deer) wonder nearby and make for a very pleasant view. The town of Keystone is a VERY short ride offering many restaurants, gift shops and fun tourist things to do. It's location is great for visiting Mount Rushmore and Crazy Horse, the best we thought. A great mix of being close to everything, yet feeling you are in a remote area. I would recommend to anyone visiting the area. We camped at Kemp's Kamp in a Motorhome. This place is very convenient to see Mt Rushmore & for riding in the mountains of the area. The camp host was pleasant & helpful. The water/sewer/electric/cable hookups were good but we could not get the Wifi to work at all. The sites were very close together and close to the road, but traffic was not heavy. Keystone, the town nearby, offered a nice mountain train ride and other touristy things to do. It was a tad expensive for the type of campground, but we would stay here again. We camped at Kemp's Kamp in a Travel Trailer. Nice setting among trees and hills. Bathrooms old and need updating and tended to be dirty. Management polite and helpful. Wi-Fi did not work during the evenings, due to system overload. We camped at Kemp's Kamp in a Motorhome. Nice, shady campground with character. Set along a scenic, winding road just outside of Keystone and 5 minutes to Mt Rushmore - very convenient for going to the evening lighting of the monument. The tourist train does pass by closely during the day, but is not very loud. Has a pool that kids were enjoying. Water/electric sites had adequate spacing between them. Only downside was the close proximity to the winding road. We camped at Kemp's Kamp in a Motorhome. I didn't pay much attention to the "Big Rig Friendly" checkbox on other reviews because we travel with a 36' 5er. Well, it was tight! We made it, good thing my husband is an excellent driver. The sights are not long enough to keep the truck hooked up. If you're not confident in your driving/towing skills, this is not the place to stay. It is VERY convenient to Mount Rushmore. Well maintained and the staff is friendly/helpful. We camped at Kemp's Kamp in a Fifth Wheel. We were way ahead of the tourists so had the camp to ourselves. It was exceptionally clean and well laid out. The owners were wonderfully friendly and helpful. It is very close to Mt. Rushmore and all of the other great Custer State Park areas. We camped at Kemp's Kamp in a Motorhome. This park is nice, although strangely laid out. The sites were long, but narrow. We were at #69. The campground was right adjacent to Old Hill City Road. During the day quite noisy with traffic and the tourist train that runs by every couple hours. At night things quieted down. They charge $5 extra for a site with sewer hook up. Since only here 2 days we passed. Our site had electric, water and cable. The showers and restrooms were clean and worked. Its located 10 minutes from Mt. Rushmore. The Borglum Museum is in Keystone and worth a stop. We would stay here again if visiting Mt. Rushmore. We camped at Kemp's Kamp in a Fifth Wheel. Excellent campground. We travel full time and I would recommend this campground to anyone. It was clean and pretty. It was close to all attractions. All our questions were answered in a helpful manner and we were given lots of printed material to help us find things. I made our reservations with the owner on line and everything at the park was just as he said and better. The couple who cleaned was friendly and went over and above to keep the grounds and restrooms immaculate. Go there and you won't be sorry. We camped at Kemp's Kamp in a Fifth Wheel. This was a good place to camp as far as access to Mt. Rushmore and Hill City, although we wished we had actually stayed in Hill City. Keystone is almost hilariously touristy. We kind of liked the train going by, and we don't mind bikers. We stayed here at the end of the Sturgis craziness, and everyone was in a good mood and having fun. Be sure to ask for a shaded site--it was hot when we were there and we missed having shade. We camped at Kemp's Kamp in a Motorhome. Well...Hmm. The sites are small, water pressure low, right next to a highway, and the owner was belittling. We would never, EVER go back here again. There are better places to stay in the area. We camped at Kemp's Kamp in a Fifth Wheel. Are you affiliated with Kemp's Kamp ?